I’m from big hair and tie die. I’m from cut up t-shirts and tights. I’m from earrings that don’t match and a second chance. I’m from air supply and Pat Benitar. I’m from ACDC and the strings on the beatles guitar. I’m from disco balls and smoking cigs in the school halls. I’m from grease and dirty dancing. I’m from cut up jeans and histericly laughing. to puffing the magic dragon and Scott Heron. and when ninth grade was still middle school. I’m from peace signs and birth control pills. John F. Kennedy, Martin Luther King & time stood still. When the make up was heavy and the music was loud. you just out such a huge smile on my face. Thank you so much for stopping by my blog. I am in love with your blog. Its refreshing. Love this poem – can totally relate! 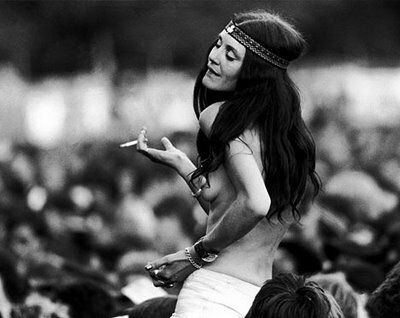 But you’re so young to be an old hippie! I know! 🙂 But i see that time so clearly. I must of lived that era in a previous life. Thank you so much for reading. It is much appreciated! <3! I enjoyed the poem. I came from the same time. Good to know real music and knowing how to enjoy life. Thank you for sharing the excellent poetry. Si cocinas como cantas hasta las raspitas me como…. Excellent words.. You are gifted! I have nominated you for the Imagine Award and Versatile Blogger Award. See my nomination posts: http://orendaginja.wordpress.com/. Thank you so much for your writing, for baring your heart and soul and being an inspiration to bloggers like me. I love it when I can relate so completely to a posting. Well done. Great post. I love The Doors and Big Hair bands and a shitload of other stuff from the 60’s through the 80’s. Scott Heron and unmatched earrings is me too! I vaguely remember being there…I think! Then again I’m merely an old fool. Excellent stuff young lady. I enjoyed this. My goodness…you are something else…. OMG – Baby Love – LOL – love it!! wow, i totally agree. you are incredible. Aw, shucks. ^_~ I think you’re pretty cool too. In another life I would have run off to Woodstock, but in this one I suppose I’ll just have to write.